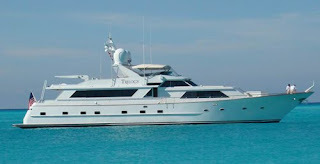 Special Charter rates for Broward built 103' Luxury Yacht Trilogy. Master Stateroom is located below deck, amidship with King size bed, his/hers heads with bath/tub and shower. The two guests cabins have Queen size beds with ensuite head with shower.